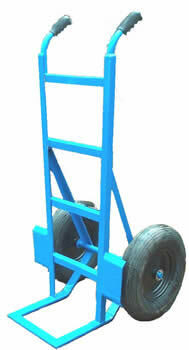 This robust truck is used for carrying heavy items and the 16” pneumatic wheels enable these items to be moved with ease. This is an ideal truck for Flaggers and for Horticultural use as well as general use within factories, warehouses and industrial units. For more information on Alan Stuart heavy Duty Delivery Trucks or Hand Trolleys in general, then please contact us.